If you invite Premium Seat ticket holders to come to an empty stadium with not a seat in sight, they will still come. 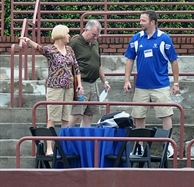 That was the scene on Saturday, May 22, when 120 Premium Seat ticket holders selected their seats at the Atlanta Tennis Championships Stadium. Buyers of champagne table, premium, platinum and gold seats were given a one-time opportunity to go into the still-barren stadium, point to a spot and say, “I want that seat!” About 40 ticket holders called in their seat preferences. Ticket holders were given a time slot to select their seats, based on the order they purchased their seats. The process took nearly four hours and was coordinated by the tournament’s entire staff. Also in attendance was Tournament Chairman Rex Maynard, who is also the USTA Southern President. Complimentary ATC car magnets and brochures were given away, along with hats provided by Tennis Channel. The stadium looked sparse, with the only furniture on display was one champagne table and a few chairs. But, that didn’t deter our dedicated tennis fans. Some ticket holders sat on the pavement, proudly enjoying the view from where they’ll watch the robust skills of ATP World Tour pros like John Isner, Lleyton Hewitt, James Blake and Atlanta’s own Robby Ginepri.